Technology Update: ThinkPad W510 DIY Upgrade – Part II. 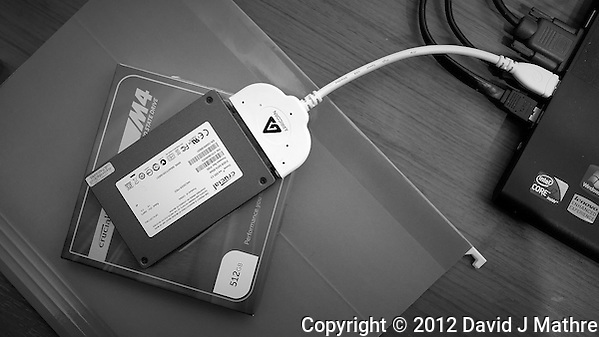 The Apricorn/Crucial data transfer program took about 4 hours make an image of my old hard drive on the new SSD drive. Access to the hard drive and memory for the W510 laptop is from the bottom. I replaced the old hard drive with the new SSD hard drive. I also checked the SIMMs installed and found two 2-GB cards. The other two cards are under the keyboard. So I did only have 8-GB of RAM installed. I should have looked up the instructions for checking on the RAM under the keyboard. Instead, I did it the hard way by removing all screws on the bottom. In the process of separating the top and bottom of the laptop case a ribbon cable became separated from its connector. I couldn’t figure how to reconnect the ribbon cable until I realized that the keyboard pops off after removing two screws from the bottom. With the keyboard removed reconnecting the ribbon cable was much easier. I put everything back together, and turned the computer on. I was amazed how quickly the computer booted up. Everything with the computer seemed snappy. I’m not sure how much of the increased speed is due to the new SSD hard drive, and how much is due to the data on the hard drive being defragmented during the data transfer process. I ordered four 4-GB SIMMS so I could upgrade the RAM in the computer to 16-GB, and then went to bed. The computer was still on when I checked it in the morning, however there was no response when I tried to enter my password. I powered the computer off, removed the keyboard cover – the easy way this time and checked the ribbon cable connection. It appeared to be loose. I realized that I hadn’t locked the ribbon cable connector. After putting everything together again, I powered the computer up and everything worked. If the SSD hard drive failed, I also had the option to use the old hard drive. The Ultra Bay hard drive caddy arrived in the mail. I didn’t expect it until next week. It was simple to install the new 1-TB hard drive into the Ultra Bay caddy, remove the CD/DVD from the Ultra Bay slot on the computer, and replace it with the new Ultra Bay hard drive caddy. When I turned the computer on, it recognized that a new device had been installed and installed new drivers. After waiting a bit, I tried to open up the MMC storage management program to set up the new hard drive. The storage management module didn’t open – locked up trying to connect to the virtual drive manager. I rebooted the computer – it still didn’t work. I rebooted the computer, to check if I missed some setting in the BIOS. It was taking too long for the computer to shut down, so I forced the power off by holding the power button down. This was a big mistake. After checking the BIOS and not finding anything I let the computer continue to reboot. Nothing – the new SSD hard drive was not recognized. I tried twice more, still nothing. I didn’t panic. I put the old hard drive back in and rebooted. This time the new 1-TB hard drive in the Ultra Bay was also recognized. I went online to the Crucial support site and found a comment that the SSD drive will go into a “safe mode” to prevent data corruption if the power goes off unexpectedly. That is probably what happened when I forced the power off. The instructions on how to reset the SSD drive were to 1) power the laptop but hold it in the BIOS setup mode for 20 minutes. 2) Turn the computer off. 3) Remove the SSD drive for 30 seconds. 4) Reinstall the SSD drive. 5) Repeat steps #1 and #2. 6) Allow the computer to reboot. This worked!! Also, the new 1-TB drive in the Ultra Bay was recognized. I formatted the 1-TB hard drive as D:-drive to be used for data. The OS, program files, and cache will be on the new faster SSD C:-drive.